I’ve seen the book more than a couple of times, even lifted it up to read the back cover, but I never got the strong urge to buy it. Although I’ve got the feeling that it’s a good book. And so when I saw the trailer and found out that it’s an Ang Lee film, I knew it’s gonna be good. I like Ang Lee. He has variety in his works, and he proves it one more time in this film adaptation of a novel about a shipwreck survivor. Since I’ve been pretty much writing in bullets about the films I’ve watched for a while now, I better continue doing it. I’m not writing for anyone, anyway. And I really don’t have the luxury of time (and drive as of the moment) to arrange my thoughts into a sort of decent and proper film review, so here goes my bullets. – I love the opening of the film. It’s such a feast for the eyes. Even my 4-year-old brother lights up with glee as he identifies the animals he recognizes while watching it. – I’m gonna say it. 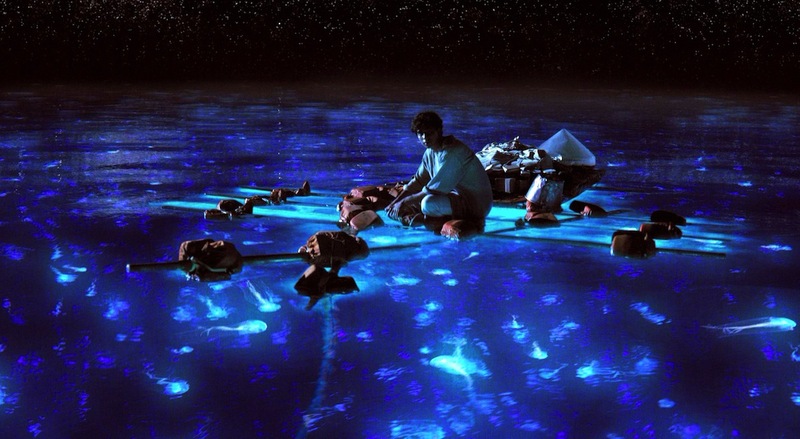 “Life of Pi” is a film meant to be watched more than once. It is set to be an Ang Lee classic someday. Yes, together with “Lust, Caution” and “Crouching Tiger, Hidden Dragon” (which I shamefully haven’t watched). – This film may bag the awards for Best Director, Cinematography, Director–oh, what the heck–all those I’ve listed above. I still have to watch Argo, though. – The Pacific Ocean is dubbed as the “calm ocean”, but I’ve never imagined it to be as calm as that in the movie. The mirror effect of the blue waters is just so amazing. – I enjoy watching Bollywood films, well, at least the popular ones, so I’ve grown accustomed to watching Indian actors. I am specially drawn to Aamir Khan in particular. I enjoy watching them. They have this captivating charm that highlights their accent. And even if some of the words are kind of hard to understand, I really enjoy hearing them speak in English. The young Pi who was floating aimlessly at sea is particularly charming in this film. – I would have loved to watch this in 3D. I’ve read some raves about it and I think it must have been a truly amazing experience. Unfortunately, I don’t have anyone to watch it with. – I had to check online while watching it if they used CGI for the animals. I would have believed them if they said they didn’t. It’s flawless. Richard Parker looks so real. I would have believe it’s real until I found out it’s not, at least in most parts. – Funny, though, that in the end that’s pretty much what the story is about. It’s about believing. – Truth, according to the investigator, is the story they can believe. They don’t believe Pi’s story about Richard Parker, the hyena, the zebra, the orangutan and the carnivorous island. They don’t believe him because that version is hard to believe. But they accepted the story about his mother, the cook and the sailor because that ugly story is easier to believe. – We are guilty of this most of the time. We believe in the things we can easily grasp, and we fail to believe that God has bigger plans for us simply because we find it so difficult to believe the things we don’t actually witness before our eyes. – This actually happened to me while watching the film. At one point I said to myself, Hey, that isn’t real. How can the boat be spanky clean with all those carcasses and blood from the dead animals? And then I realized, this is a movie and not the reality. It’s the director’s imagination, and it’s for me whether to believe it and enjoy the story or doubt everything and waste my time. I chose the former and thought instead that Richard Parker is very good at housekeeping. And he really has to consume everything and not leave any tiny bit of the food available while at sea. – However ugly life could get sometimes, it still is, indeed, beautiful. The world is full of things that attest to this fact, and this is clearly illustrated in the movie. That’s life according to Ang Lee’s wonderful narration. – This particular quote hits home. An uncle died yesterday and this quote holds so true. But I was glad that I got to visit him last weekend. I didn’t say a proper goodbye, though, because I was afraid to accept the fact that I might never see him again. Acceptance is a very difficult thing to do. Although I already know that’s bound to happen, I think I still wanted to cling to that last hope that things will turn around and he would be well again. “Above all: don’t lose hope,” says Pi in the film. But sometimes you just have to let go because that’s life and that’s according to Pi. This entry was posted in Me, Myself and Arl, Spud Times and tagged Ang Lee, Life of Pi, oscars 2013. Bookmark the permalink.